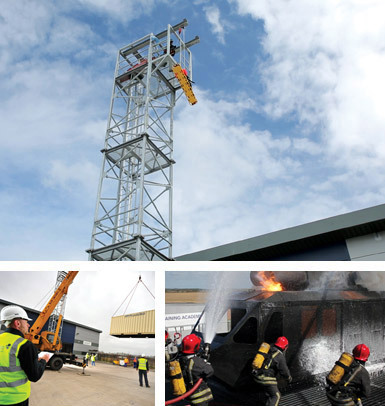 Practical training is delivered on our extensive training ground which includes a 3 storey offshore platform rig with full size heli-deck and Super Puma helicopter mock-up. In addition to this we also have an extensive Breathing Apparatus and Confined Space Training Complex, full sized aircraft fire-fighting rig, fire screens, engine and wing fire simulators and HGV tanker simulators. Our facility can provide realistic fire-fighting opportunities in a number of configurations both internally and externally for Class A, Class B & Class C fires.